"A Keyblade that provides an extra boost in Strength and deals higher damage when you land a critical hit." 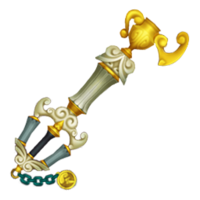 The Mark of a Hero is a Keychain for Terra's, Ventus's, and Aqua's Keyblades that appears in Kingdom Hearts Birth by Sleep. 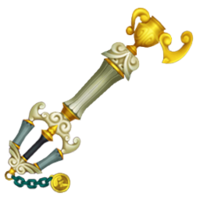 The Mark of a Hero's blade and guard are both modeled after the stone columns used in the Olympus Coliseum. The blade is light grey and the sides of the guard are slate grey, and both are topped by white, cloud-shaped swirls. 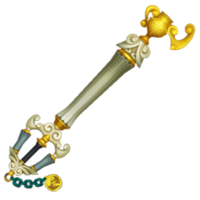 The handle is black and the entire Keyblade sports small, gold highlights. The blade acts as a pedestal for a golden trophy on its tip. One of the trophy's handles is upturned, resembling an arm being flexed, and forms the Mark of a Hero's teeth. The Keychain has teal-colored chain links and the token is the golden Olympus Stone. The Mark of a Hero's name may refer to the ability to become a "true hero," a common theme in the Olympus Coliseum storylines. It is also similar in name to the Mark of Mastery exam, which Keyblade wielders must pass in order to become Keyblade Masters. This page was last edited on 6 September 2018, at 22:41.